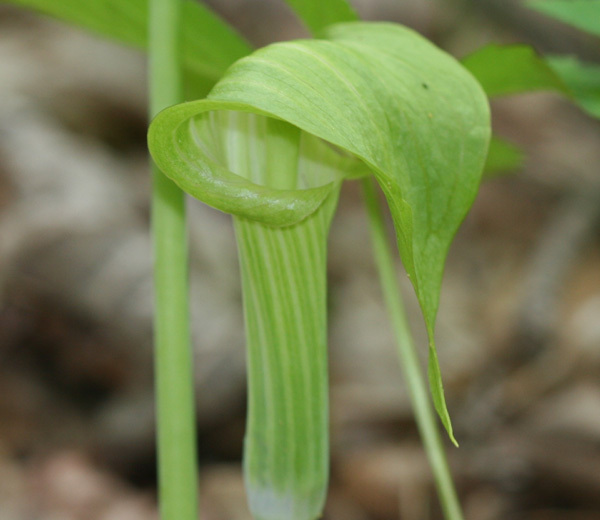 When I was upstate this past weekend my Aunt Bonnie mentioned that she had come across a couple Jack in the Pulpit (Arisaema triphyllum) in the woods near her house. I was intrigued as it had been years since I had seen one and they are such cool-looking plants, named for their likeness to a preacher in the pulpit, so she walked me down to where she had found them and, after we had pulled up a bunch of invasive garlic mustard, I took some pictures of the Jack in the Pulpit. Most people (myself included until recently) would assume that the pictures above are of the flower of the plant, but they would be wrong. What is shown above is actually the spathe (the pulpit) and spadix (jack) of the plant. The tiny flowers of the plant actually grow on the spadix. It takes several years for a plant to be mature enough to actually flower: for the first years of the plant’s life all the energy it gets from the sun goes towards building up reserves and it does not attempt to flower and reproduce until at least three years have passed. But the young plants do produce three-part leaves like in the picture below. Some subspecies of Jack in the Pulpit have one set of leaves and others have two. The colors inside the spathe can vary as well, but the dark purple is the most common. I’m not sure if the plant above and below is just what a younger plant looks like or if it is a different subspecies of than the purple ones. 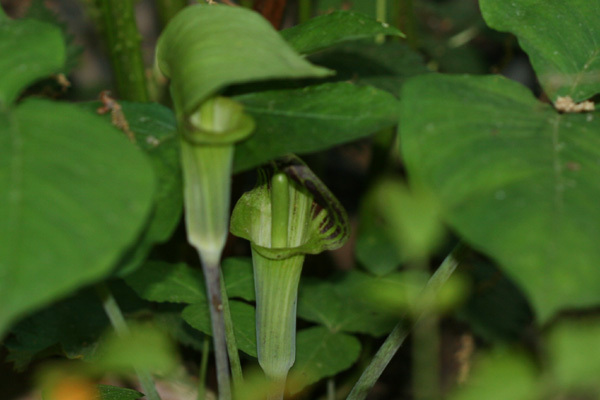 One can find Jack in the Pulpit, an herbaceous perennial, in moist woodlands across eastern North America and as far west as Texas. Their seeds are contained in berries which are green until they ripen to a bright red. Anyway, upon my return from upstate I started to wonder in Jack in the Pulpit is present in any of New York City’s parks. I got my answer when I met a gentleman who leads plant walks for the parks department at the waterhole at Forest Park. I asked him about it and he walked about five paces and pointed one out to me. Did I ever feel silly! There were several more in the general vicinity, two of which are pictured below. So get out to your local woodland and if the birds aren’t calling from up above look down low and find one of these native plants to admire (that is, if you live in eastern North America). 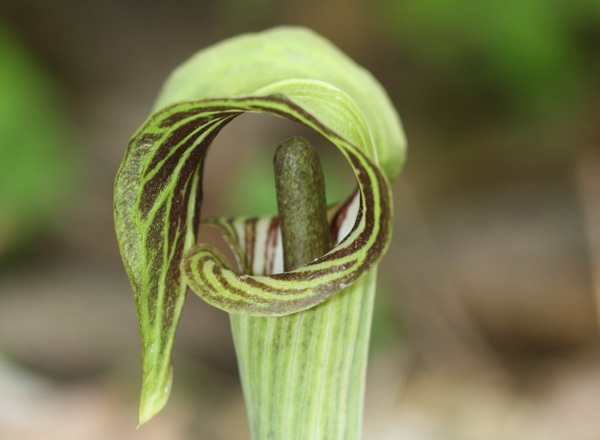 Corey . . stunning photos of these Jack-in-the-Pulpits! They are an amazing flower and a great find along the streams! Neat pics, Corey, and I have been on an anti- garlic mustard crusade ever since. Now if I could just get rid of that thriving bed of poison ivy…. Really good photos, Corey. Isn’t it funny how silly we feel when we ask someone about something that is practically under our noses? Been there, done that. ;o) That plant is really neat; maybe someday I may get to see one in person; but I wouldn’t want to hold my breath. I’m glad I’ve got blogging friends back east so I can enjoy what they are enjoying. Thanks for sharing, Corey. 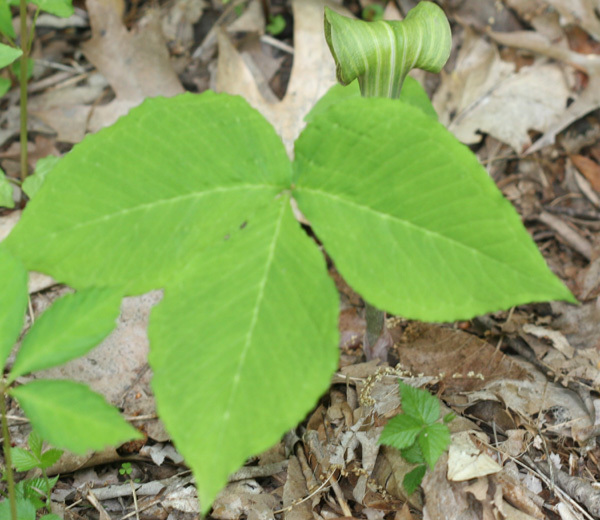 I grew up in southern Indiana and played in the woods.We would see jack-in-the-pulpits and arrow heads and played in caves and looked at fossils.Those days are over but I do enjoy pictures of these plants.The area I grew up in bordered the Indiana state forest. Where Are You Birding This 4th Weekend of May 2008? Wild Parrots In The Bronx?! ?